Jonesborough United Methodist Church has been a part of Tennessee's oldest town since it was first organized as a church in 1822. Work was started on the church structure in 1845, and looked very much the same as it does today. 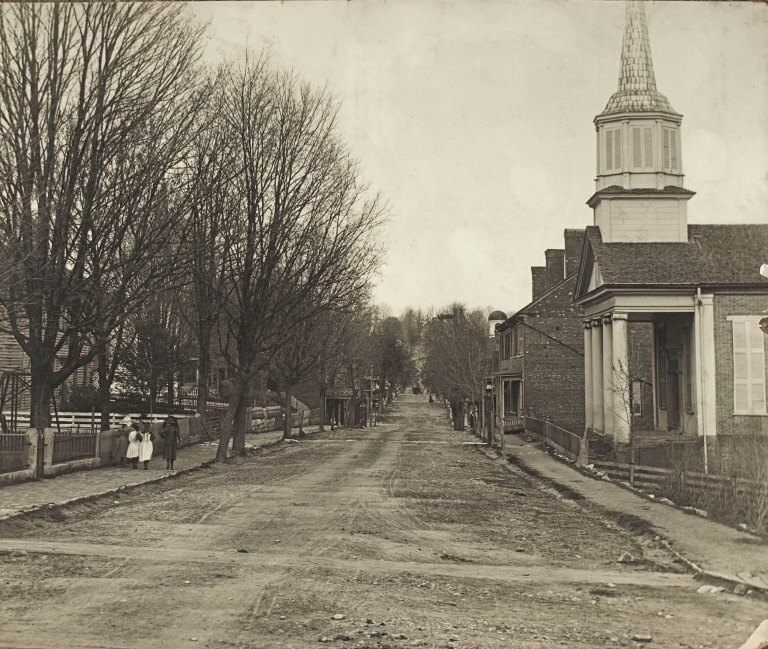 In the past century and a half Jonesborough has continued to make a faithful witness. It has ministered to the needs of neighbors here at home and around the world. Although Jonesborough has a proud and distinguished history, the greatest focus of attention is placed on how we can minister faithfully now and in the future by fulfilling the great commission of Jesus Christ. 1820 by Samuel Jackson as a home for his three daughters. Photo taken circa 1890. 1819 H. R. W. Hill is converted in a powerful meeting at Franklin County, Tennessee, under the preaching of Bishop William McKendree. He becomes a dear friend of the bishop. these meetings. Several people are converted, and the church is born. 1825 The second session of the Holston Annual conference was held in Jonesborough. The Jonesborough Wesleyan Female Society, an affiliate of the Wesleyan Missionary and Bible Society presents the Holston Conference a gift equal to the salary of a preacher for one year. 1835 600 men in Washington County sign a petition to get a railroad funded through town. This precipitates the need for Jonesborough Methodist to relocate. 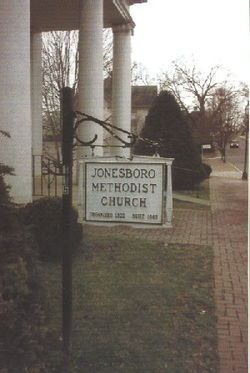 1847 The First Quarterly Conference of the Jonesborough Station meets in the “new Methodist Church” at 211 West Main Street. William G. Brownlow is in attendance as a local elder in said church. 1855 The members of the Quarterly Conference appointed a committee to sell off the back of the church lot in order to pay Landon C. Hoss the money he had put forward to finish the church. 1865 The Civil War ends and the building is seized by a group of pro-union activists. An out-migration occurs as many people relocate to the new town of Johnson City. 1870 The Building is awarded by the court back to the original church people. 1875 The Steeple is rebuilt, and pews are replaced. 1892 The original windows are replaced. 1904 Sister’s Row House is purchased as a residence for the pastor. 1928 The present windows with stained-glass were installed. 1948 The sanctuary was completely restored, with new plaster, electricity, and the balcony and basement reopened for use. The chandelier was also hung during this period. 1959 The Education Building was added to the back of the building. 1985 The Rogers Hybrid Electronic and Pipe Organ is installed.